Postcolonial Digital Humanities | Download the #GWWI poster for your own splinter event! Download the #GWWI poster for your own splinter event! 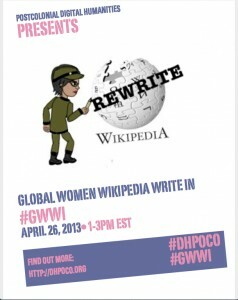 On April 26, we’ll be hosting #GWWI, the Global Women Write-In event! This virtual event is designed to encourage internet users to write entries about women from around the world into Wikipedia and to improve existing entries on these topics. Download our #GWWI poster to publicize your own splinter event! Feel free to remix/adapt as you please. If you’re planning to join us, do sign up on our Wikipedia event page.